I had a terrific time at Boskone this past weekend, though it was so busy I don’t think I’m completely recovered yet. I had a full schedule! I started the weekend early, meeting buddies Charlaine Harris and Dana Cameron for lunch on Friday. Much gossip and hilarity ensued, and I’m not saying any more than that. Then I met with Ginjer Buchanan, my editor at both Ace and Berkley Prime Crime, and it was time to plot book plans. I’m not saying any more about that either, at least not yet. Next I met with Charlaine and Ginjer again for a dinner to celebrate our success with anthologies and to plot our new projects. I’ve already broken that story, that we’re all set for two more anthologies. Friday night, Boskone had arranged a Fangtasia interactive show, which Charlaine participated in. Some very convincing portrayals of Sookie and other characters from Charlaine’s books, and they served punch that was suspiciously thick and red. I think what tickled me most was realizing that the evil bartender in black was also the friendly instructor from Guard Up!, a fencing school where my daughters have taken classes and where we had Valerie’s last birthday party. It was a different look for him. After that, I couldn’t resist a brief look at the amazing art show. The artist Guest of Honor was Gregory Manchess, and his work is just amazing. First off, he does pirates, which is a particular weakness of mine. Second, he was exhibiting an astounding version of Dorothy, Toto, the Scarecrow, the Tin Man, the Cowardly Lion, and a flying monkey that I adore. 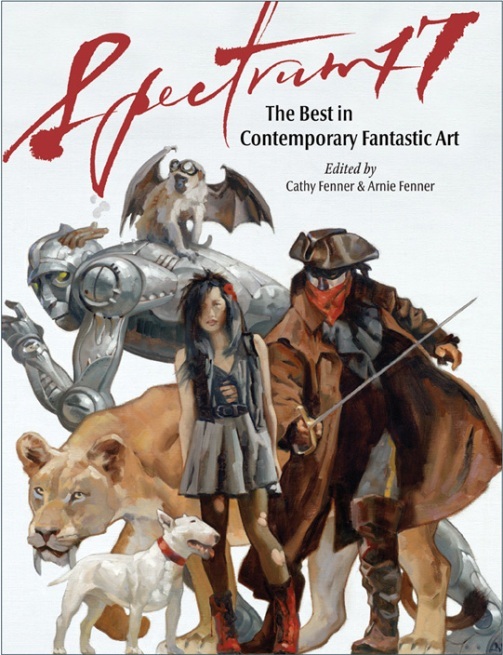 It’s on the cover of the book Spectrum 17, and I really really hope he gets prints made of it. Another artist did these wonderful whimsical pictures of classic Halloween toys, and though I wrote down the name of the artist, I can’t find the slip of paper. (Never fear–I will track him down before Halloween.) And the third was a woman named Donna Lee Young who did these graphic-heaving paintings of happy skeletons and that flowed onto the edges of the canvas. I know, I’m describing them badly, but they were awesome. And don’t think those were the only wonderful artists showing their work, either. Saturday was filled with panels–three of ’em!–and lunch with Dana and our pal Beth Krueger and a kaffeeklatsch. Fortunately, I didn’t actually have to drink coffee for the kaffeeklatsch. Instead Charlaine and I visited with a double-table-ful of really nice people. That night was one of the conventions highlights. Joshua Bilmes, president of the JABberwocky Literary Agency, was celebrating his twenty-fifth year anniversary as an agent. And since he first entered into the world of SF fandom at Boskone, what better place to celebrate? So he took a crew of us to Morton’s Steakhouse to party. The group included Joshua, Ginjer and her husband and fellow editor John Douglas, Charlaine, Peter Brett, Myke Cole, Joshua’s sister Aura (I probably spelled that wrong), a young writer named K.J. from Somerville whose last name I’ve forgotten, and myself. (I may have forgotten someone, and if so, I do apologize.) It was just lovely, and Joshua should be rightfully proud of all the books he’s helped bring to the shelves. Charlaine and I zipped back to Boskone to attend the awards ceremony, and I was quite touched when I got a shout-out and a round of applause for my efforts in bringing Charlaine to Boskone. Here’s my confession: All I did was send Charlaine one e-mail. That’s it. But they can’t take the shout-out back now! The next morning came far too early, but I had to be up to see Charlaine off after her last panel, and to get to my reading. I read an excerpt from my zombie mystery story from the upcoming Home Improvement: Undead Edition to a small but choice audience. Then I finally got a chance to see the rest of the Art Show and the Huckster’s Room before settling down for a book signing. I was surprised when so many people brought me copies of my mysteries to sign. Boskone is an SF con, after all. This did not, however, stop me from signing. After that, I was ready to go home and collapse, but we ended up staying two more hours because Valerie was in the midst of a tournament of the game Munchkin, which went on forever. On the good side, she won, and also on the good side, it meant we were still there when one last really nifty thing happened. Joshua had wanted one last bit of celebration for his agent-ish anniversary, and also to give a thank-you to Boskone. So he’d bought two enormous cakes for the con suite, and handed out pieces. Yum! 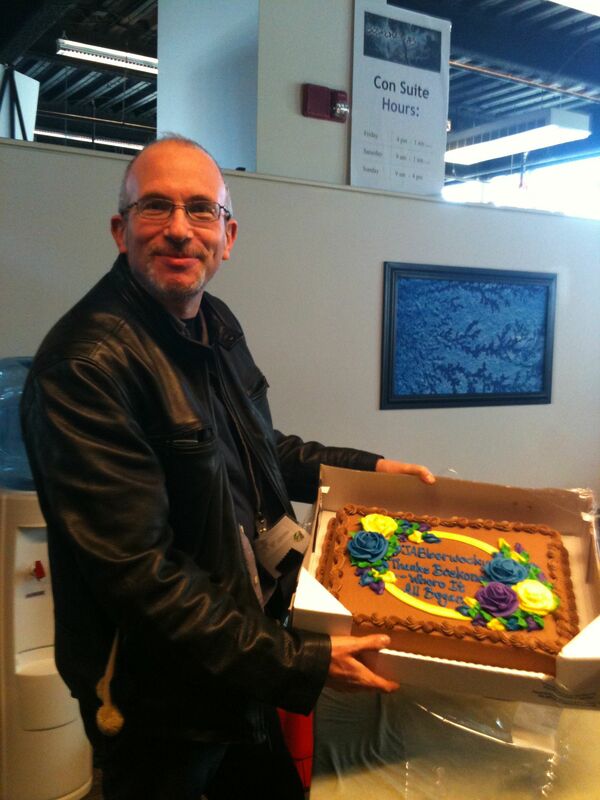 Here’s the proud agent and one of the cakes. So there, at incredible length, is my Boskone report. And I know darned well I’ve left out people and events I should have mentioned–it was an incredibly fun and full weekend.